This userpage is under construction. Therefore, please excuse its informal appearance while it's being worked on. I hope to have it completed as soon as possible. This user is YoshiFlutterJump (talk). All of this user's userboxes are free for anyone to use! Hooray! sprite-0 This user cannot rip sprites at all. This user likes the Nintendo DS. 40px This user likes the Wii. This user likes the Nintendo Switch. This user loves the Nintendo 3DS. This user's favorite console is the Wii U. This user's favorite Mario character is Yoshi. This user's least favorite Mario character is Jojora. This user's second favorite video game is Mario & Luigi: Dream Team. This user's third favorite video game is Super Mario Odyssey. Some sneaky trickster tried to impersonate this user. This user loves the Yoshi franchise. This user is a good friend of LuigiMaster123 (talk). This user has a powerful friendship with Skuchi037 (talk)! This user is friends with MKDSFan. This user is friends with Choco Late (talk). This user is a proud (and weird) friend of WeirdDave13 (talk)! Welcome to my user page! I am YoshiFlutterJump, but you can call me YFJ. I am 13 years old, and I live in North Carolina. My birthday is on December 14. I am a big fan of the Mario franchise, and my favorite games include Super Mario Galaxy 2, Mario & Luigi: Dream Team, and Super Mario Odyssey. I own a Wii, a Wii U, a Switch, a 3DS, and a DS. I also have a forum account, and I'm more active there than here. My NNID is also YoshiFlutterJump. I have an account on the Scratch programming community, but it's only active in the summertime. I write Tips and Tricks in the 'Shroom Strategy Wing, which turned out to be a much bigger success than I expected. I edit mostly from my phone; however, I use the desktop version of the website because the mobile version is terrible. Aside from the wiki and forums, I love to give people strategies for various games, which is basically what I do in the 'Shroom. I've always dreamed of becoming an astronomer and love anything to do with outer space, although I will likely become a game developer and possibly work for Nintendo. Anyone reading has permission to use any of the userboxes on this page (except those containing my username). I actually don't own most of them. Get Super Mario Galaxy and Super Mario Galaxy 2 featured. Create articles for Mini Mario & Friends worlds and levels (with LuigiMaster123 (talk)). Expand the Super Mario Tennis page to cover all eight levels in the minigame, and split them if necessary. Help merge DK Wiki with this one. 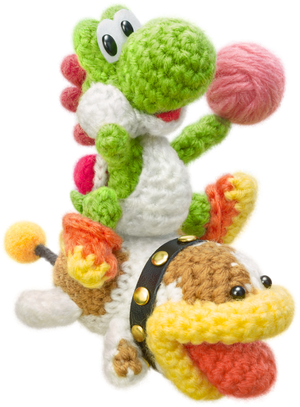 Add anchor links and redirects to the amiibo patterns in List of Yoshi designs in Yoshi's Woolly World. Add anchor links and redirects to the regular patterns in List of Yoshi designs in Yoshi's Woolly World. I discovered this wiki, uh, I dunno, around 2012? I know I visited this wiki a whole lot starting 2015. I finally joined on March 23, 2017, 00:29. I made my first edit on March 23, 2017, 00:34. I was autoconfirmed on March 27, 2017, 00:29. Ironically, I was out of town then, so I don't know the exact time. But because it's called Autoconfirmed, the date and time is easy to guess. I had already made five edits before I left. I joined the 'Shroom Strategy Wing team on November 19, 2017, 03:31 with the section "YoshiFlutterJump's Tips and Tricks!". I actually wasn't promoted to shroomwriter rank until November 27, 2017, 15:35. See the user rights log. Listed by console, with an estimated completion percentage for each game. Section under construction. This is a list of my user subpages. This is where I write my theories about Mario games. In Mario & Luigi: Paper Jam, when the Mario Bros. are about to escape the Twinsy Tropics Dungeon, they are confronted by Wendy, followed by Roy. Larry, however, is late for his shift and is supposedly playing video games. Larry later teams with Ludwig to stop the Mario Bros. from entering Bowser's Castle. What video game was Larry playing? If Larry wasn't late, who would Ludwig's backup be? And why is Iggy the only Koopaling fought in only one boss battle? These questions and more are answered in Behind the Scenes in Mario & Luigi: Paper Jam. Wendy: "Ha ha ha ha! Wendy: You could have just sat quietly in your cell like good little prisoners...But noooo, you had to escape and make us chase after you. So inconsiderate." Roy: "Whatever! This is as far as they're getting!" (notices Larry's absence) "Hey, Larry! Come help us subdue these prisoners!" (waits) "Hey! Larry!" Roy: "Probably off playing video games or something." Wendy: (waits) "Ugh, it figures. Do we have to do everything ourselves?" Wendy: "Stupid Larry! If he had been here, there's no way we would've lost!" Roy: "Yeah! This isn't over, chumps!" Bowser: "Wendy! Roy! Larry! Did they escape or not? Give me good news! Bowser: "THEY ESCAPED?! YOU INCOMPETENT FOOLS!!!" (notices Larry is absent) "And where is Larry? He was fighting with you, wasn't he?" Roy: "Oh, you think Larry helped us? A certain Koopaling was off playing video games while Wendy and I did all the work!" Wendy: "Yeah! We would've won if that lazybones was there! But noooo, he decided to play video games while three jailbirds escaped the dungeon!" Larry: "Yippee! I'm about to get first place! Mario was no match for me!" Larry: "What is it, Lord Bowser?" Bowser: "YOU WERE PLAYING MARIO KART 8 WHILE YOUR SIBLINGS BATTLED THE MARIO BROTHERS?! YOU'RE GROUNDED, LARRY!" Bowser: "Attention, all Koopalings! Larry was late to stop three jailbirds from escaping, so I am re-arranging the shifts!" Wendy, Roy, Larry Someone came late to their shift. Larry, Ludwig, Iggy Larry was moved here, while Iggy was moved to Shift 3. Morton, Lemmy, Iggy Iggy was moved here, but he can wait until after the modifications to the castle are complete. Bowser: "Now, Paper Bowser, let's get to work on those modifications." Mario Kart 8 was the only existing game with Larry as a playable character when Paper Jam was released. What better game for Larry to play? UPDATE: Super Smash Bros. 4 also existed during the time. Still, MK8 is more likely. Iggy is only fought at the end of the game. It only makes sense that he was Ludwig's original backup. Now, let the reviews begin! My first review is among the three newest main-series Mario Party games (the only ones I own, actually). I will look at each game and point out its pros and cons. I may do IT vs. SR in the next review. Mario Party 8 can be described in two words: pure awesomeness. I despise all game reviewers who put this at the bottom of the list; it doesn't deserve such treatment. It is actually the best Mario Party game I have played so far (among 8, 9, 10, IT, and SR)! I don't understand how anybody could hate this game. But let's cut to the point. The game has its pros and it has its cons. Pros? Trust me, this is not nostalgia-biased. Mario Party 8 is a great game. It is, however, the only game I own (excluding MP10's amiibo Party) that uses the classic Mario Party gameplay. Basically, for any newbies to Mario Party games, MP8 is a game in which the player collects coins to buy Stars. A minigame occurs after every turn as an opportunity to earn Coins; however, coins can also be earned from board events or special Candies. Each Candy has a different effect; some affect the dice block, while others affect the Coin or Star(!) counts of opponents. Conditions to get Stars vary by board; for example, DK's Treetop Temple requires players to journey across the board to buy one, while Koopa's Tycoon Town requires players to invest in hotels. The winner is the player with the most Stars. The Story Mode, called the Star Battle, is fun as well. Basically, the player faces off against random opponents in five Duel Battles, each one with a different board. The sixth battle is located at Bowser's Warped Orbit and is against Hammer Bro or Blooper, the unlockable characters of the game. The seventh battle pits the player against Bowser, the final boss. The minigames are fun as well; Nintendo chose At the Chomp Wash, Aim of the Game, and Crank to Rank as the MP8 minigames in Mario Party 100. My personal favorites are Spector Inspector, Cardiators, Flagging Rights, and Superstar Showdown (the final boss). Its minigame mode selection is also great; Test for the Best was my favorite. Actually, the only downsides I can think of are that (1) the Nunchuck is only used in one extra minigame, preventing free two-hand motion control from being used in any other minigame; and (2) the "staff best" records are seemingly false. I found Mario Party 9 an improvement from Mario Party 8 when I first played it...but only because it was new at the time. Now, as I look back upon it, I deem it as the worst Mario Party game I've ever played. Let me tell you why. Mario Party 9 is (in)famous for overhauling the series gameplay. Now players must compete for the most Mini Stars while cramped in a vehicle. Each player takes turns being "Captain" and rolling the dice block to move the vehicle. Additionally, minigames are now only played when the players land on a Minigame Space. Special Dice Blocks now replace Candies from MP8 and Items from earlier games, and each player can hold 2. Boards are now linear and consist of two "bosses". A notable change to boss battles is that they are now multiplayer. The downside? These "bosses" aren't bosses at all! While MP8's final boss was too easy, there is no way the bosses, even the final boss, can win! Instead, Nintendo expects players to rely on "cooperatition" (a pun on "cooperation" and "competition"); work as a team, but at the same time, be rivals. This attempt at shifting boss battles to multiplayer falls flat. What's surprising is that they even reused this mechanic in MP10 and SR! The boards have a nice variety, though; a grand total of seven boards appear in this game. The minigames are a lot more fun than the board game, however, with my all-time favorite in this game being Block and Roll. Mario Party 100 included Bumper Bubbles, Don't Look, Goomba Bowling, Jigsaw Jumble, Logger Heads, Magma Mayhem, Peak Precision, Pier Pressure, Speeding Bullets, and Tackle Takedown from this game, which is many more minigames than MP100 had from 8 and 10. The solo minigame mode is Time Attack, in which players play through ten minigames as fast as possible; the ultimate goal is to beat the staff best (which may not actually be fake in this game). The story mode is called "Solo". In this mode players play through the first six boards in seemingly regular parties to recover the Mini Stars from Bowser. These are not regular parties, however, as the bosses are preset in every board rather than just Bowser Station (yes, Bowser is in outer space again), and the unlockable characters, Shy Guy and Magikoopa, play for Bowser in each round. While the player really doesn't have to win any of the rounds, he must prevent one of those characters from winning; otherwise they steal all the Mini Stars he collected and the player has to retry the board. Bowser doesn't have a malicious plan at all, really; he is just trying to decorate his castle. My thoughts on Mario Party 10 are mixed; it's better than MP9, but not as good as MP8. This game has three party modes: a standard Mario Party mode (similar to MP9), a brand-new Bowser Party mode, and a kind-of-new amiibo Party mode (similar to, but not the same as, MP1-8). For Mario Party mode, I might as well copy-and-paste all my negative comments about MP9 here, because all my complaints are the same. Special Dice Blocks also return from MP9. However, this time around, Bowser is trapped inside the GamePad, and each number on the Normal Dice Block is a lock on a cage. If all 6 numbers are rolled, the player who destroyed the last lock loses half his Mini Stars, and Bowser scatters Bowser Spaces around the board. If the players reach the Checkpoint Flag, Bowser is sealed up for good and Bowser Jr. makes Bowser Jr. Spaces instead. These spaces are just like Bowser Spaces, except the effect isn't as harsh. However, there is less variety in this mode than MP9, in that there are only 5 boards and about 70 minigames. It's not bad, though. And once again, the "bosses", even the final bosses (Bowser and Dry Bowser), are not even bosses. Bowser Party is the grand return of Bowser since MP4, but now he is playable in every mode except Mario Party (in which he is the penultimate boss) and some extra minigames. In this mode, all characters playable in Mario Party are grouped into "Team Mario" (even if Mario isn't playing); and Bowser, with the help of Bowser Jr., Whomp, and some other minions, attempts to destroy Team Mario. Unlike Mario Party mode, Team Mario can hold 3 special dice blocks. There also must always be four Team Mario members in Bowser Party. Bowser rolls 4 Bowser Dice Blocks, although the members of Team Mario can add to or subtract from that number depending on the space they land on. If Bowser catches Team Mario, a Bowser Battle minigame will commence. Bowser also has emotions that change throughout the game; he starts feeling indifferent, and if he catches Team Mario, one of five easier (for Team Mario) Bowser Battles will commence. Sometimes Bowser feels angry, and if he catches Team Mario in this state, one of five "Bowser's angry" minigames will start. During Big Bad Bowser Mode, Bowser feels furious (although he doesn't look it), and if he catches Team Mario in this state, he gets to choose from a random three of the five "Bowser's angry" minigames. Team Mario wins if they reach the Star at the end of the board, while Bowser wins if he wipes out Team Mario beforehand. Mostly a fun mode, but Bowser Party gives Bowser a vast advantage (well, he's Bowser), only three of the five boards are playable, and the ten Bowser Battles are the only minigames played in this mode. Lastly, we have amiibo Party, which is not as bad as everyone says it is. amiibo Party can be unlocked by tapping a compatible amiibo Figure on the main menu. Players can choose between nine boards, depending on the amiibo Figures they own. There is also a secret unlockable board called the Normal Board. The nice thing about this mode is that players can even create custom boards by mixing-and-matching other board parts. It seems to be based off the gameplay style of MP1-8, as players must collect coins and trade them in to get a Star. However, parties are always 10 turns and boards are completely linear! However, there is a Reverse Dice Block that players can use to go backward up to 6 spaces, and a Bowser Jr. Token to stay in place. Speaking of tokens, players can use such power-ups if they have an amiibo. Some tokens are useless when Bowser is playing, however. Not every character is playable in this mode; only Mario, Luigi, Peach, Yoshi, Toad, Wario, Donkey Kong, Rosalina, and Bowser (requires amiibo) are playable. If Bowser is playing, every minigame will be a Bowser Battle. If he is not, Free-for-All, 2-vs.-2 (4 players), 1-vs.-2 (3 players, or 1-vs.-3 (4 players) minigames will be played. On the Bowser Board, if the player lands on a Bowser Jr. Space, he will play a Bowser Jr. Challenge. If the player wins, he will receive coins, but if Bowser Jr. wins, the player will lose coins. The biggest problem with this mode is that use of the amiibo seems...unnecessary. However (many people don't know this), except for collecting and using Tokens, the GamePad's A Button can substitute tapping an amiibo. The minigames are just as fun as the minigames of MP8 and MP9. My favorite is Bowser's Hammer Slammer. Nintendo chose Badminton Bash, Flash Forward, Jewel Drop, and Soar to Score to be in Mario Party 100. There are also three minigame modes called Coin Challenge, Minigame Tournament, and Bowser Challenge. My favorite is Bowser Challenge, and it is actually a Thanksgiving tradition in my house to play a Minigame Tournament with the whole family (although I think MP7's Deluxe Cruise would be better, but I don't have MP7). I will rate each game based on Party, Mingames, and Replayability. Then I will calculate the Total, Overall (mathematical), and Overall (opinionative) ratings. So in the end, MP8 ranks first, MP10 is second, and MP9 is last. This is my friend userbox. You can ask me to use my userbox on my talk page. This page was last edited on March 28, 2019, at 01:48.